Studies consistently show that working out with a friend is a) more fun, and b) more fruitful. So in this month of love-sharing, we say ditch the chocolates and share the love of rock-solid abs! Join us for our February focus class and learn how to spice up your fitness routine with fun, heart-pumping Pilates exercises you can do as a a duo. It’s a perfect opp to kinect with a friend, spouse, coworker, neighbor, or that cutie next to you at the (juice) bar. Thursday, 2/17 from 6-7pm $20/per person. Partner not required, but if you snag a pal to come along with you, it’s $35 for both! 1. 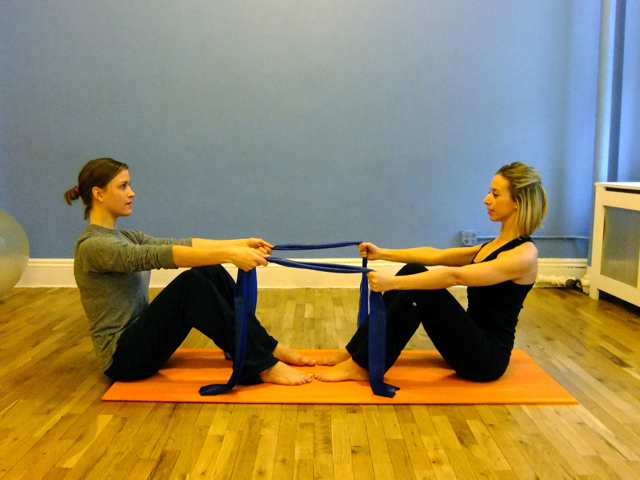 Starting position: Stabilizing partner holds ends of therabands so that band is taut; stabilizing partner’s forearms should be perpendicular to the mat. Roll-down partner begins sitting tall, with an inhale. 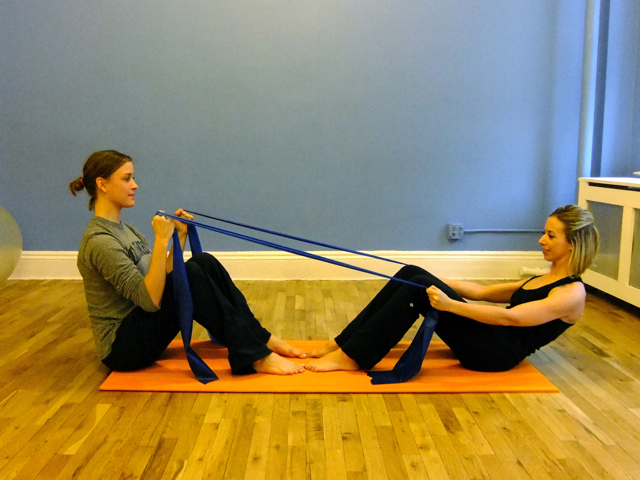 On an exhale, the roll-down partner initiates a roll-down with a pelvic tuck, continuing to round her spine and articulate through each vertebra, until she reaches a half-way point. 2. 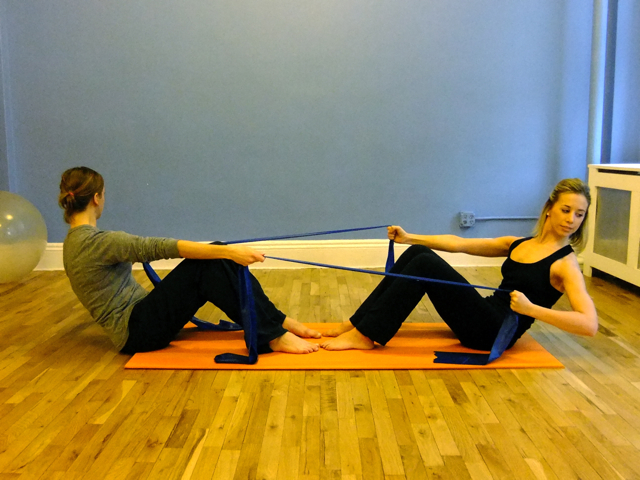 Stabilizing partner continues to hold position, keeping abdominals activated, breathing, and encouraging partner! Partner #2 inhales at bottom of roll down, returning to sitting position with her exhale. Looking for a twist? Try version #2! 1. 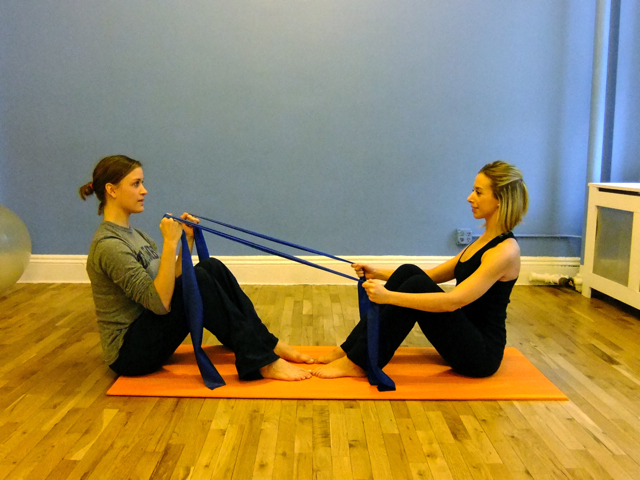 At original sitting position, both partners choke up on theraband so it is taut and their elbows are extended. On exhale, both partners initiate a half roll-back with a pelvic tuck. 2. 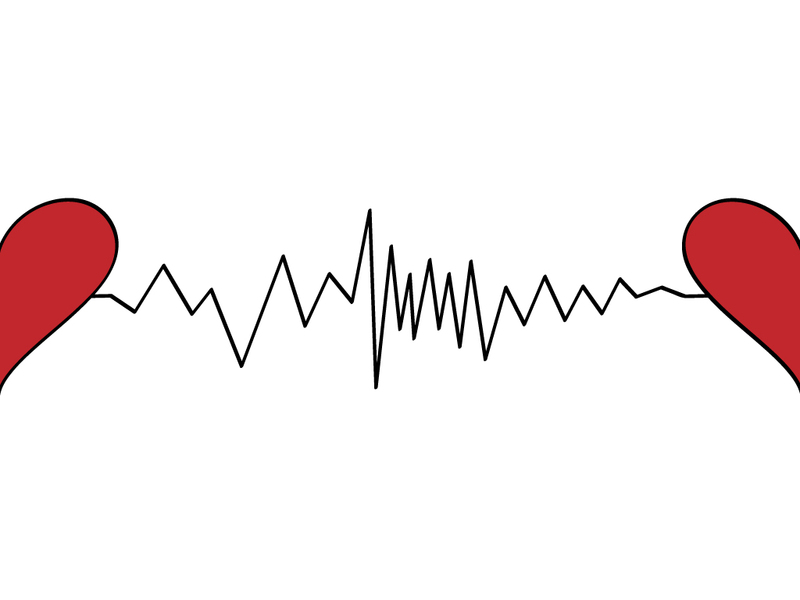 At the end of the half-roll back, both partners inhale; on exhale, partners twist opposite directions, engaging obliques and keeping feet planted on the mat. 3. 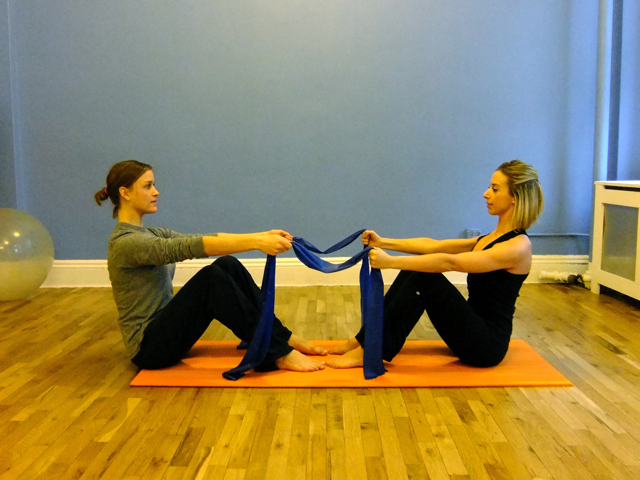 On inhale, partners twist back to center, and with an exhale, roll up and return to starting position.